People long for the light, and that’s what the books in my store do. They shed light in time of darkness. That’s why a bookstore is the place where heaven and earth meet. 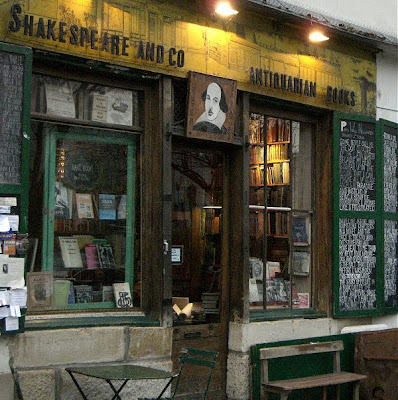 Those are the words of George Whitman, founder of the famous Shakespeare & Co bookstore in Paris, and I took that photo of his store a couple of years ago. Today comes the news that the HMV music retail chain in the UK is appointing an administrator. In recent years HMV stopped taking classical music seriously, but for many of us serendipitous discoveries in their flagship Oxford Street store were part of our musical education. As self-appointed cultural commentators speculate on who will head the Berlin Philharmonic in 2018 we are told to step into the digital era and stop buying CDs. But what will classical music look like in 2018? Are we right to accept the loss of bricks and mortar retailers and the death of the CD as an inevitable consequence of new technologies? Are we confusing progress with intellectual property monopoly? Have eBooks established a restrictive business model that recorded classical music will be forced to adopt? Will a proprietary Amazon music download format join Apple’s iTunes? Will Amazon become a record label as well as a book publisher? Will the hegemony of the online retailers soon be complete? In the future will an alliance of Amazon and Apple decide who conducts the Berlin Philharmonic – just as today the legacy record companies dictate who conducts the Vienna Philharmonic’s new year’s day concert? Will heaven and earth ever meet online? Is classical music asking the right questions? The digital era has allowed publishing companies to micromanage the distribution of their products, simultaneously expanding the global reach of select artists and diminishing the markets for the rest. Where once I could order physical CDs (books, films, sheet music) and have them shipped around the world (albeit often at some expense to an Australian), now I am blocked by vendor sites because my computer IP address or my credit address is in the wrong country. Most recently I was thrice knocked back from buying a young artist's debut album because PayPal would not allow my "delivery address" despite the product being an digital download. Naturally there are forward-thinking labels like Hyperion who sell their music uncompressed globally, but they are in the minority. I would say I'm knocked back on digital purchases for about 3 albums per week, because I'm in the "wrong" location. In connection with the above comment it is worth noting the new Alia Vox release Erasmus. Buying the CDs gives a password which allows the purchaser to download both high-resolution and mp3 albums plus five language options for the texts. Alia Vox aren't communicating this innovative bonus very clearly, but it is a development worth keeping an eye on. I'll ask the label for more information and will try to write more.